Many cultivated plants can trace their 'roots' to common roadside wildflowers and forests and gardeners often assume that the wild or native form is simply an escapee from someone's garden. Wildflowers and native trees and shrubs are beloved treasures that have inspired poets, artists and storytellers from around the world and learning to recognize them and preserving their declining habitat is something all gardeners should want to do. 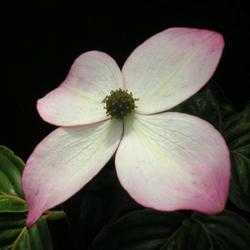 The dogwood tree (Cornus florida) is a familiar landscape plant for most of the world. Gardeners can purchase one from any number of places, from local garden centers to big box stores. The familiar white or pink blossoms are commonplace in many gardens and herald the official beginning of spring. There are hundreds of named cultivars and prices range from just a few dollars, to pricey selections offered by exclusive nurseries. However, this garden showpiece had its humble beginnings as a small under-story tree in temperate hardwood forests. While the Cornus floida is native to Eastern North America, its spring show is so beloved, it is now found in most countries. Gardeners in the United Kingdom find them especially attractive and the trees do well in their climate. Japan also loves the American dogwood and in 2012, to mark the 100th anniversary of their gift of the 3000 iconic cherry trees that grace Washington D.C.'s tidal basin, 3000 dogwood trees were sent to Japan to commemorate the event. There is a popular legend about the dogwood tree concerning Easter. It is said that the cross was constructed from a dogwood tree and the pink or red centers on the edges of the bracts represent the nail holes in the hands and feet of Jesus. It is also said that is why the tree seldom grows very tall, that is was ashamed to have been used for such a purpose and refused to grow big enough to construct a cross ever again. In fact, dogwoods are not native to Palastine and the story was created in the 1950's to promote tourism in North Carolina. It sold a lot of post cards and souvenirs, but the story is simply urban legend. The large blossoms are not actually dogwood flowers. They are showy bracts similar to what one would see on a poinsettia. The actual flowers are in the small cluster in the center of these bracts. The bracts serve to attract insects to pollinate the insignificant flowers. 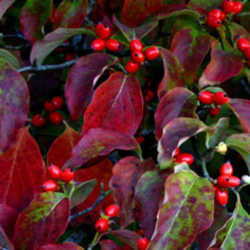 The next season's flowers also form after the current show is over, so pruning a dogwood tree in late summer or autumn will rob you of the spring display. 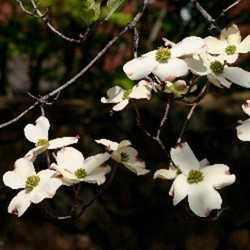 If you must prune a dogwood tree, do so sparingly and right after flowering. Dogwoods bloom around the time of the usual last frost and the showy trees are often seen sprinkled through the forests and on the edges of fields. The white bracts look like clouds of butterflies floating among the new spring leaves of nearby trees. These wild trees are often slender, having multiple trunks and without the shape or symmetry of their cultivated cousins. However, they have an authentic charm all their own. The spring blossoms give way to bright red foliage and berries in the fall, making it a great tree for all seasons, plus, many birds and animals love the berries, so it is great for attracting wildlife. This tree is also on many HOA lists of approved plants, since so many of them are requiring natives instead of imported species. Dogwood trees are naturally under-story trees, most often found at woods edges, growing in the sheltered areas under taller trees such as oaks or hickories. They like a bit of afternoon shade and a rich humus soil, similar to what would be found in the leaf litter of a forest. These are small trees or large shrubs, rarely reaching more than 30' (9m) tall. 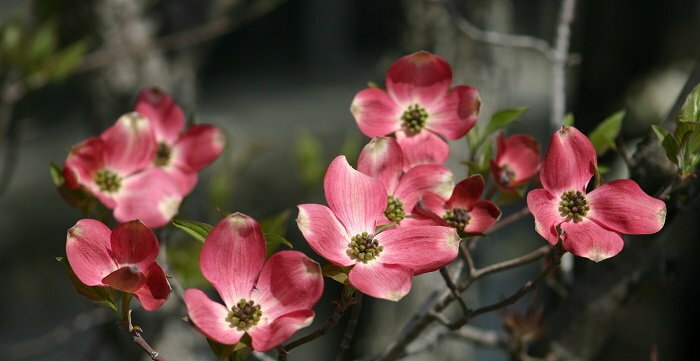 Dogwoods can grow in full sun, and their spring show is more spectacular when they receive around 8 hours each day. However, the more sun the tree gets, the more moisture it will need, so make sure to supplement water during dry periods. They are susceptible to powdery mildew, so situating them where morning sun can dry the leaves is a good idea. The dogwood borer is a troublesome pest, but protecting your tree from injury deters them, since they enter the bark through cuts and wounds. Take special care with lawn edgers and weed-whackers, as they contribute a large percentage of trunk injuries to trees. Whether your choice is pure white, deep pink, or somewhere in between, (some gardeners plant one tree of each color in the same hole to create a bicolor effect.) The dogwood is a great choice for small yards and gardens, as well as larger properties. There's year-round interest and it attracts birds and wildlife. Chances are, your local garden center has some right now, or you can check out our participating PlantScout vendors that offer them too. They're beautiful as a specimen tree or in a clustered group, so consider a dogwood for your garden today!